The remains of the storage space: lockers at König + Neurath. There has been talk of the paperless office for quite some time now. It would now appear to be reality – at least if the exhibitors at this year’s Orgatec trade fair are to be believed. Offices and modern architecture – two things that for a long time did not have a close relationship, because while the modern architecture aimed to tidy everything up with its clear lines and reduced shapes, offices, with all their paper, files, writing utensils and staplers, stubbornly resisted this purism. Not until the era of all-embracing digitization did the vision of the paperless office seem to be within reach. All those bothersome documents and the many devices would now be redundant. The purists breathed a sigh of relief, but quickly discovered that other things that were no less bothersome took their place: offices in the early days of computers were crammed full with towers and desktops, tube monitors and matrix printers, CD stands and loudly humming and beeping modems – not to mention kilometers of cables. Today though, when a mobile telephone can completely replace a mainframe computer and all information is stored on the company server or in the cloud anyway, when all information is readily available on the Internet and any document can be sent electronically – today at long last the office modernity dreamt of would seem to be feasible. A cool box in the office? No, in this container you’ll soon be keeping your personal items safe in the office – at least if furniture manufacturer VS has any say in the matter, that is. Anybody taking a look around this year’s Orgatec would be forgiven for suspecting that to a large extent the office furniture sector at least has decided to declare all forms of larger storage space superfluous. Visitors can enjoy an unimpeded view of the fair stands, because there is hardly a tall set of shelves or a partition in sight. If there is no room for something on an electronic storage medium it is confined to a small cabinet next to or beneath your desk – if you still have a desk of your own at all, that is. If you do desk sharing and move from one workstation to another, then you in any case have to make do with wheeled containers or lockers the size of letterboxes. 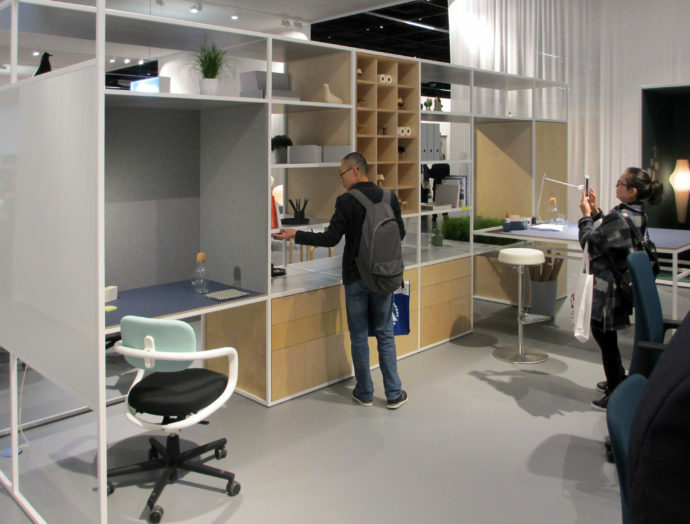 There are also containers on display at Orgatec which you take out of your own compartment in the morning and attach to the particular desk you are sitting at. To this end VS has designed something in between a lunch box and a cool bag that is intended for office staff to store their documents and belongings in. 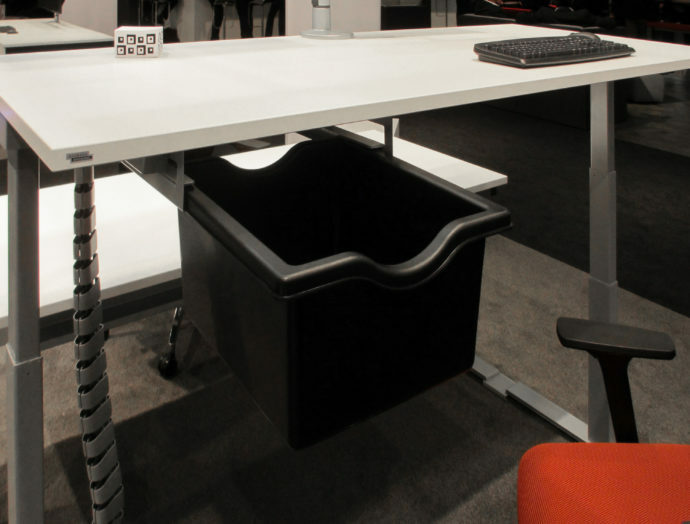 For office furniture manufacturer Assmann, a straightforward small plastic tub has to suffice. It’s no wonder, because the company is also of the opinion that that for those who still have a desk of their own, the small personal storage space in the lower cabinet is in part superfluous. For this reason it is integrating a pull-out footstool there for putting your legs up. 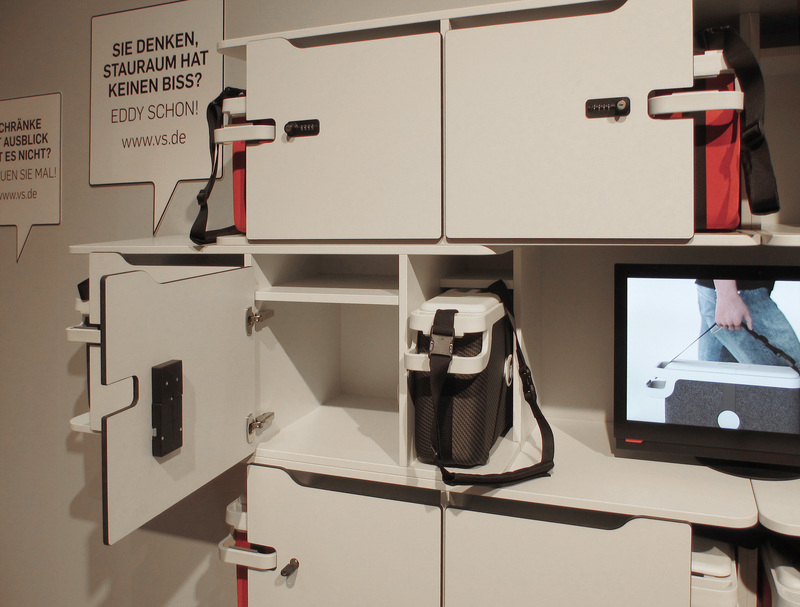 The tub is empty: Mini-solution for personal items from Assmann. 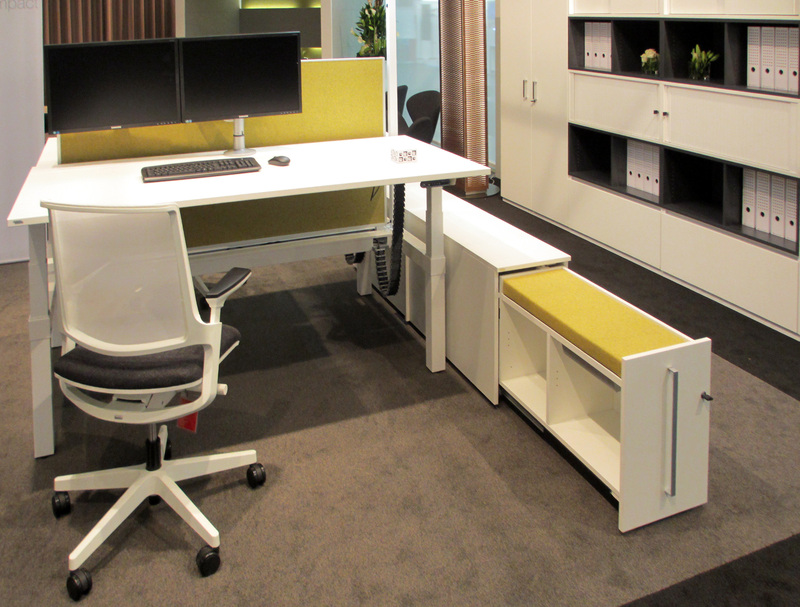 Put your feet up: At Orgatec Assmann is displaying its leg support in the desk cabinet. 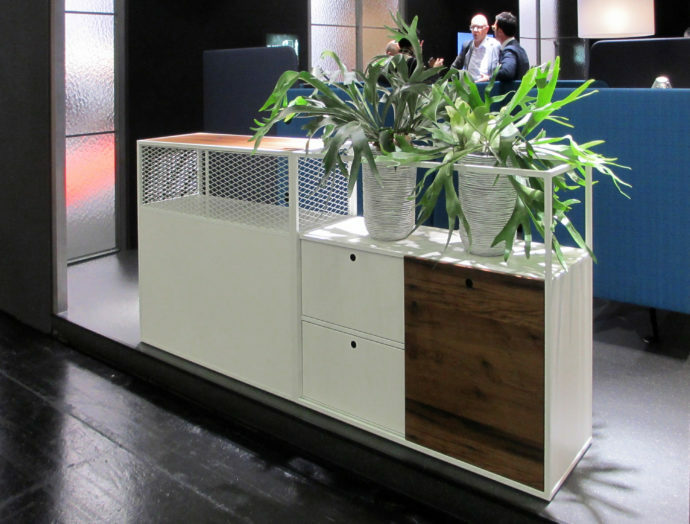 Lots of manufacturers also have low sideboards on display, though it remains unclear as to whether they meet an actual need or have just been assembled because they don’t disturb the openness of the stands’ architecture. Furniko at least has positioned one of the omnipresent acoustic elements on its sideboard, which thus becomes a bench. It seems there’s nothing to store away anyway. In its search for a second use for its side cabinets, Wiesner Hager came up with a special attachment for pot plants, which gives the furniture real mid-century appeal à la “Mad Men” – when in offices smoking was still allowed and people still wrote on paper. Sitting still: At Furniko the acoustic element becomes upholstery. The return of succulents: Wiesner Hager has a soft spot for pot plants. Unifor has on display a prototype of the “Element” cabinet, which was designed by Foster + Partners. 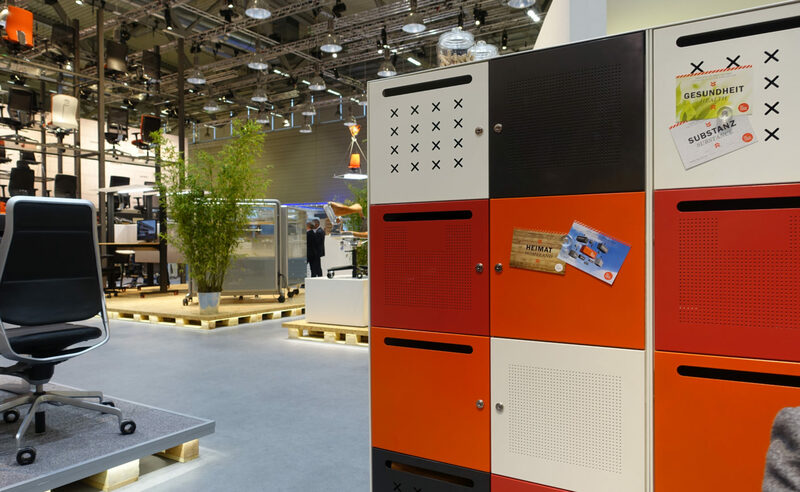 It has also given the classic “Totem” cabinet from the “LessLess” series by Jean Nouvel a makeover. It is now available in new materials and colors. Likewise still at the prototype stage were two ingenious shutter cabinets by the French manufacturer Jec, which were designed by Jean-Michel Wilmotte. Horizontal shutters serve equally as their wall and door. 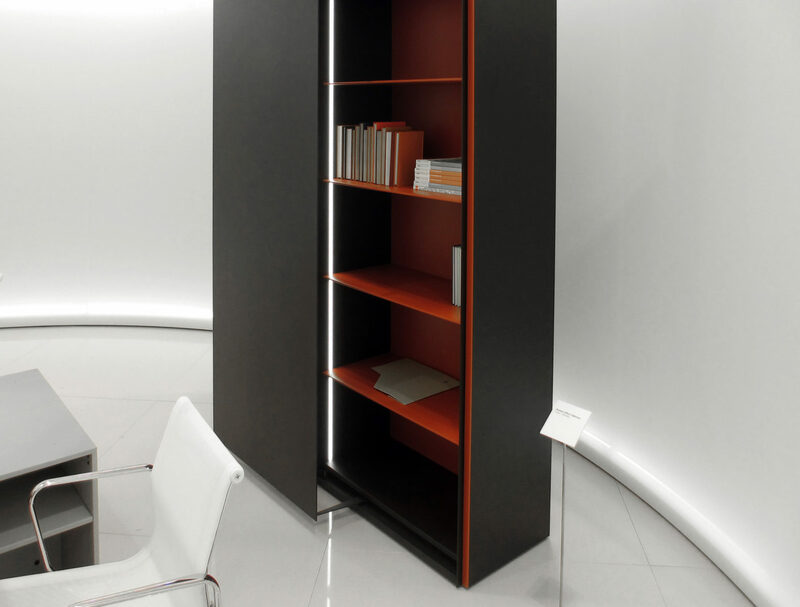 The architect’s cabinet: Foster + Partners designed “Element” for Unifor. Designed by Werner Aisslinger for Piure, the system furniture “Mesh” is one of the very few new shelving and storage systems. The company is clearly convinced that in tomorrow’s offices as well, things will still have to be stored away and put on shelves. Precisely in the bright colors available the furniture makes a striking impact. So is Aisslinger of all people in this sense the anti-modernist who is fostering the knick-knack chaos in offices? 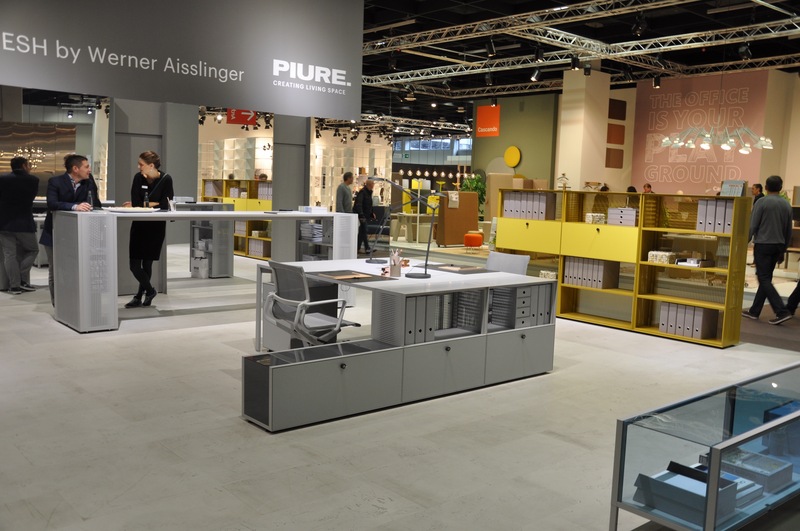 “Mesh” in all its versions: The Piure stand at Orgatec. Finally, at the spacious Vitra stand there was also a shelving system in use as a partition. “Kado” is its name, and it actually has its origins in the company’s retail range, in which it has featured for some time now. Only when Vitra and the London-based interior designer Sevil Peach fitted out the new Studio Office at company headquarters did it discover the qualities of “Kado” for offices, in which the metal structure is intended to carry out a number of functions, with individual client solutions and standardized elements in mind. 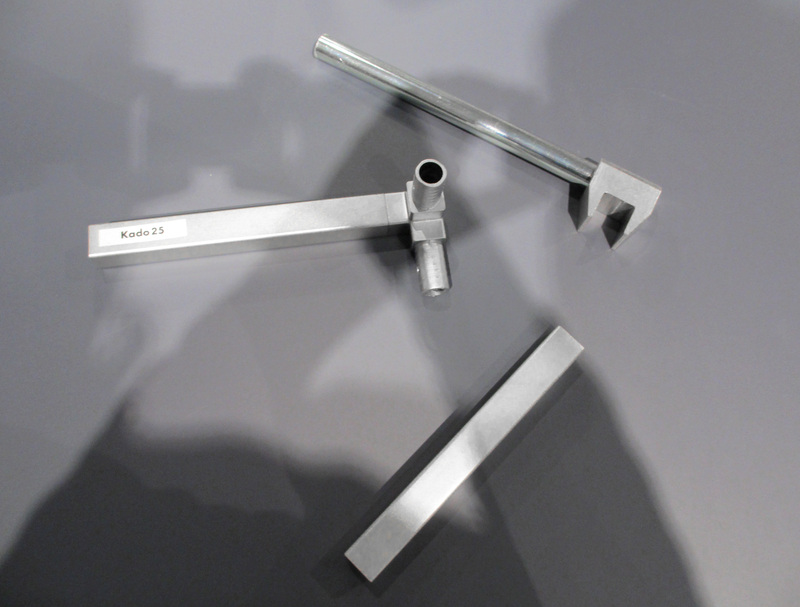 The development of series solutions such as these for fittings has not yet been completed, meaning that at the present time only the metal frame is available from Vitra. So is the paperless, fully digitized, minimalistic office now going to become the norm? Who knows? Perhaps there is still a chance of shelves, storage space, files, and books remaining part of our working world. 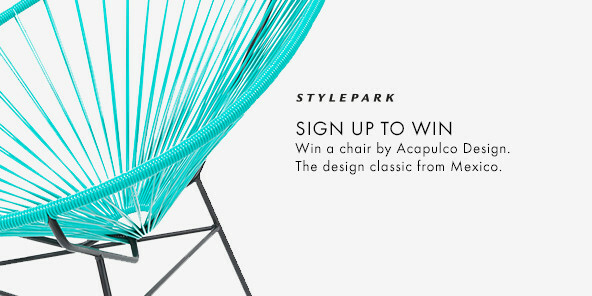 Perhaps the new systems by Vitra and Piure are the start of a turnaround. New tasks for “Kado”: Vitra’s new shelving system for the office was actually developed for shops. Just click together: Connecting element for the “Kado” system.